One of the drivers of the two double-decker buses that collided in Times Square Tuesday afternoon, injuring 14, has been arrested, police say. Gray Line bus driver William Dalambert of Irvington, New Jersey, was charged with driving while ability impaired following the crash at Seventh Avenue and West 47th Street. Police charge drivers with driving while ability impaired if they get behind the wheel after using prescription or illicit drugs or they appear to be impaired by alcohol but have a blood-alcohol content lower than the minimum limit for the charge of driving while intoxicated. Law enforcement sources say Dalambert, 58, failed a field sobriety test at the crash scene. Test results on whether he took illegal or prescription drugs are pending. He was released from police custody Wednesday evening. According to the New Jersey Motor Vehicle Commission, Dalambert has numerous license suspensions on his record for administrative violations, including being an uninsured motorist and not submitting necessary paperwork for a commercial license. Thirteen pedestrians and a tour guide were hurt when the two buses collided near the famous red staircase of the TKTS booth in the middle of one of the most heavily trafficked areas in the city. It's not clear what caused the collision. Most of the pedestrians were injured by the falling light pole and flying debris from the pole and the bus, FDNY officials said in a news conference Tuesday afternoon. A tour guide aboard one of the buses was injured when she was thrown forward and her head smacked the dashboard, officials said. She's expected to be OK. Neither bus driver was hurt. A witness said he was walking on the sidewalk near one of the buses when he heard what he first thought was some sort of explosion. Fourteen people were injured when two double-decker buses collided in Times Square Tuesday afternoon, causing a traffic light pole to topple over and smash onto the ground, authorities say. Gus Rosendale reports. "It was only sound, and a lamppost fell down," said Sanjay Shah of Wayne, New Jersey. "Nobody can imagine a bus going on the sidewalk and hitting the lamppost." Officials said emergency responders initially had difficulty getting to the scene because of heavy traffic in the area, and some firefighters rushed to the crash site on foot. All of the injured victims were treated at the scene. Some were later taken to area hospitals in stable condition and were expected to be released this week. "We are very, very fortunate there weren't many more injuries," said an FDNY official. Gray Line New York, which is owned by Twin America in Hoboken, has 137 registered vehicles and 260 drivers, according to the Federal Motor Carrier Safety Administration. In the last two years, the company has been cited 17 times for vehicle maintenance violations, including tire problems and broken tail lights, head lights and horns. None of the violations were serious. The company received no violations for unsafe driving, hours of service compliance or drug and alcohol-related offenses. There also were no reports of crashes involving Gray Line vehicles that caused deaths or injuries in the two years prior to Tuesday's accident. In a statement, Twin America said it was cooperating with authorities. “Twin America is committed to the highest standards of safety and customer service and in addition to cooperating with local authorities, we are simultaneously conducting a thorough internal review of our safety rules and driver protocols,” the statement said. 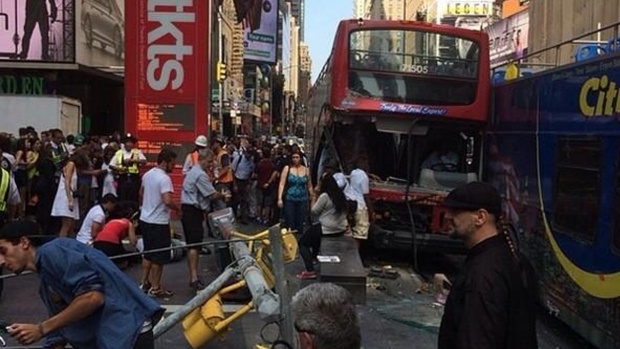 United Bus LLC owns the CitySightsNY bus that was involved in the crash. According to the FMCSA, United Bus has been cited three times in the last two years for vehicle maintenance issues, the most severe of which involved a problem with tires. There were no serious violations or violations in any other category during that time period. United Bus was involved in one fatal crash in the last two years.